International Business Times reported Monday: “American blogger Pamela Geller named as world’s top Islamophobe.” What honors are bestowed upon me in my fight in defense of freedom. The more good you pursue in the era of evil, the more of a monster you’re portrayed as being. Of note, though there were many media outlets covering this fake news, IBT was the only publication to mention that I have been the target of multiple Islamic assassination plots. “A controversial American blogger has been accused of being the internet’s most virulent Islamphobe [sic] by researchers. 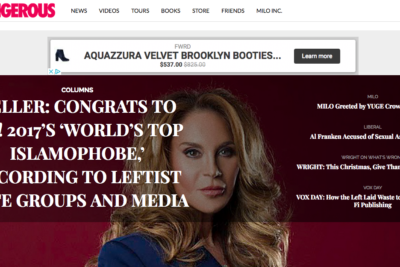 Pamela Geller was named by not-for-profit Hope Not Hate as a major figure in a growing network of far-right social media influencers.” It’s all part of the ongoing attempt to destroy my platform and that of everyone who stands up against jihad terror. It all started on Sunday, when this article in the Guardian, falsely claimed that I amplify my social media presence with bots. Twitter, along with the other social media giants, hound and delete and silence and scrub the presence of those who oppose jihad terror, and the Guardian article was a call for them to finish the job. The Guardian piece is the very definition of fake news. They claim that my tweets are magnified by 102 bots that automatically tweet or retweet my content. Bots? What bots? These are my Twitter accounts: @pamelageller, @atlasshrugs, @sioamerica, @afdi, @sionations. @myjihadUS, @GellerReport. How highly they must think of me, that I know how to operate 102 bots! This false and defamatory article by the Guardian is simply a thinly-disguised call to Twitter to limit my platform even more than it already is. Meanwhile, the claims in this article are just the opposite of reality. Newspapers such as the Guardian, the New York Times, and the Huffington Post would be out of business without the artificial stimulus provided by Facebook, Twitter, and other social media platforms, which links to them in their newsfeeds and trending topics. They literally get hundreds of thousands of referrals everyday. Mind you, if you search this Guardian article on Twitter, it has already been tweeted by bot accounts over 2 dozen times. There are over 48 million bots on Twitter. Twitter features them in their trending hashtags. My Twitter account, on the other hand, is shadow-banned. My site, by contrast, is never ever given linkage by any of these social media giants. Whatever influence I have is due to the daily sweat of my brow. They have done everything in their power to shut me down — Facebook, Google search, Google Adsense, YouTube, and even Pinterest (!). My website and posts have been scrubbed from Google search. Fourteen years and over forty thousand posts, gone. Google Adsense has banned my account. Google is blacklisting and has admitted to working with alt-left smear groups to silence opposition. Facebook has blocked my news feed. I have been blocked from uploading videos to YouTube as punishment for a 2007 video on jihad (and YouTube demonetized all of my videos). PayPal suspended me until an outpouring of condemnation and outrage forced a reversal. And it’s not just me, it’s all criticism of jihad and sharia. The Guardian attacks those of us who cover jihad terror, and go after people whose interest in piqued in the aftermath of jihad terror attacks, as if it were somehow wrong or strange to be interested in the ideology that incites people to bombings, car rampages, mass shootings, and stabbings in the cause of Allah. The Guardian seems to believe that we are supposed to ignore all that in order to show proper respect for Islam. The Guardian says: “Many have recorded significant growth in their social media followings over the past year, co-ordinating to push the message that Islam is an ‘imminent threat’ to western society.” Yet what I report on every day at the Geller Report is true and accurate. If there is a threat, it is coming from the Muslims who scream “Allahu akbar” while murdering the kuffar, not from me. In reality, it is the Guardian trying to make sure people don’t have a sober and realistic understanding of the nature and magnitude of the jihad threat and of what is happening all around them. Almost immediately, the Guardian’s fallacious fake news report was picked up and wildly embellished upon by leftist, self-loathing Jewish media. They expanded the false premise even further. Monday’s front page article in the Jewish News/Times of Israel is a whole other level of smear (the headline alone….“Researchers say Jewish blogger who’s banned from the UK is top Islamophobe”). Seriously? It is literally not what the article was even about. The smear now takes on a life of its own — a “report” from the dangerous sharia police group “Hope Not Hate” is being given enormous respect and legitimacy by leftist and Jewish media, with absolutely no investigation into the “science” or mythology behind the report. It’s a smear job, and the media is lapping it up. But this piece, in the Times of Israel, no less, is particularly egregious. They and their ilk are pathetically silent in the face of rampant Islamic Jew-hatred in the Muslim world and the vicious blood libels against the Jewish people invented by the invented “Palestinian” annihilationists. Did the Jewish News contact me for comment on this story? Of course not. Did they even read my rebuttal? Of course not. If they had, they would not have run such specious, false trash. The Jewish News/Times of Israel is now one of the worst of the Jewish left self-loathing publications. Their description of the notorious hate organization, the Southern Poverty Law Center (SPLC), is comical, as is the description of my work and me. The UK is riddled with jihad terror and sharia-based violence, just as I predicted. The more right I am, the more vicious the self-loathing Jews. My fervent prayer is that rational, clear thinking people will see through this fake news. This kind of wholesale smear is detailed in my book FATWA: Hunted in America. This is what happens to every freedom-loving human being, in small and large ways, who stands against jihad terror and in defense of freedom. Pamela Geller is the President of the American Freedom Defense Initiative (AFDI), publisher of The Geller Report and author of the bestselling book, FATWA: Hunted in America (published by Dangerous Books, a division of MILO, Inc), as well as The Post-American Presidency: The Obama Administration’s War on America and Stop the Islamization of America: A Practical Guide to the Resistance. Follow her on Twitter and Facebook.